Nick Reinhart is one of favorite innovative players out there with the unconventional use of pedals out there. I’ve been a fan for a long time – starting with his band Tera Melos and later with his contribution to the killer site – Pedals and Effects (collaborations with Juan Alderete). 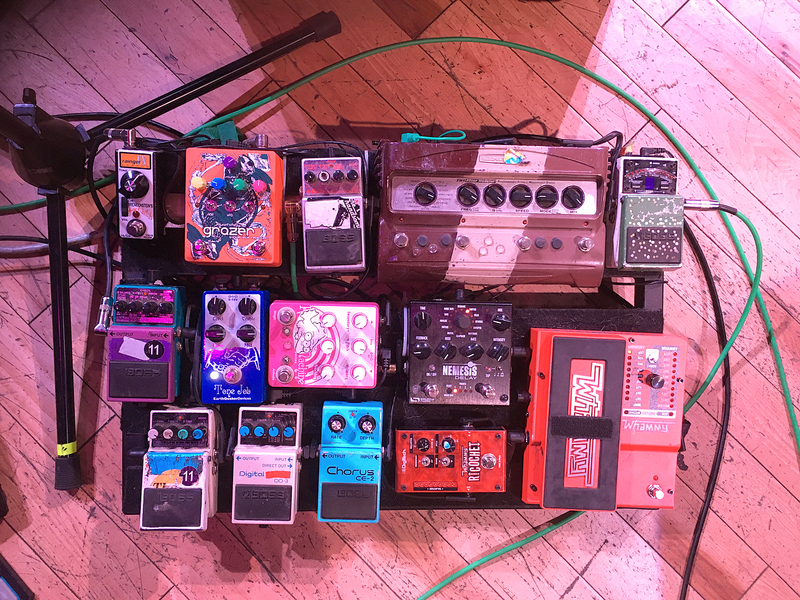 About a week ago on Nick’s Instagram account, I saw he recently posted a board shot (board one of two) of what he took on the the recent tour with Tera Melos and thought you guys might find it interesting as well. You’ll notice some of the Boss pedals look a bit off. Over time, he’s swapped out the footpads from other Boss pedals, so the colors do not match up – specifically the TU-2 and the SYB-3. Check it out!